E arlier this year drugs.ie published a feature entitled: Research on Head Shop Drugs in Dublin: Part 1. This feature focused on a piece of research which sought to identify the compounds of a number of the top selling pills and powders on sale in head shops in Dublin. The majority of the products were found to contain compounds which were included on the recent list of substances which have been banned for sale in Ireland. The research recently won the Best Poster prize at the 32nd All Ireland Joint Schools of Pharmacy Research Seminar, held in the School of Pharmacy in Queens University Belfast. In the previous feature, Pierce Kavanagh from the Department of Pharmacology and Therapeutics in Trinities centre for Health Sciences outlined the importance of the research and also made some predictions relating to what we might expect to see after the recent ban. As predicted in the previous feature, an expected outcome relating to the recent government ban has been the emergence of new (post ban) products on sale in head shops in Dublin. 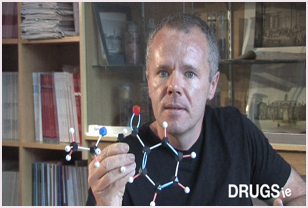 A variety of next generation compounds have appeared for sale in head shops in Dublin. These new products contain new chemicals, which are not subject to the recent ban. These include: Ethcathinone, Naphyrone, Dimethocaine, Dimethylamylamine, Synephrine, and Dimethylamylamine. In this follow up feature, Pierce explains how the manufacturers of these new products could make very basic changes to the existing banned substances to create the next generation compounds which are now appearing in the new products. Because a number of these new products have not been seen and analysed before, many contain what Pierce describes as "unknowns". This is of great concern, as Pierce explains. "These unknowns could be deliberately incorporated active materials, manufactured in a lab, or in some cases significant impurities introduced during the manufacturing of these products. Whatever is know about the active ingredients, we essentially know nothing about the impurities". In this feature, Pierce outlines the work being conducted in the lab to identify certain unknowns. According to Pierce, this type of work raises an interesting question: how much effort should really be put into the identification of an unknown? "This comes down to the balance between the threat to society and the need to know. It is also influenced by the rather short lifespan that some recreational drugs have in the marketplace." "We are now entering a phase where we are looking into what impurities/by-products may be present in the products. Whatever may be known about the actives themselves little or nothing is known about the impurities/by-products. This is typified by ‘iso-ethcathinone’ which we believe arises as a by-product during the synthesis of ethcathinone. At present we are carrying out toxicological studies on this compound. We have also identified several NGC’s which we feel will be prominent on the market in the near future and these are being synthesized for analytical and toxicological evaluation." Pierce and the team in the lab have continued to chart their work in relation to identification and categorisation of products on sale. This is particularly useful for A&E, drug treatment, GP services and any agencies involved in the area of drug prevention and education. However, work of this nature is not without its difficulties. "Most of the work is now very intensive and expensive. It really falls outside what would be expected of a laboratory performing routine analysis. A mature and rational re-evaluation of current drugs legislation is required to facilitate researchers, explains Pierce."